Get the best Professional dry cleaning services in CT! While in our care, your garments will be cleaned with high-quality,top of the linedry cleaning solvents and detergents using state-of-the-art equipment by our experienced staff. Eco friendly services are available upon request. All collars and cuffs are prespotted prior to cleaning. We specialize in wedding gown, communion and christening preservation. Gowns are inspected and tested before they are cleaned and preserved. Prior to returning any garment to you, we’ll closely inspect it for stains, missing or cracked buttons, and minor repairs. Get expensive designer garments prepared by the experts with hand pressing and hand finished Chinese style laundered shirt services. Every detail will be attended to as we press your garment’s inside pockets, tack labels, roll lapels to fall properly, and remove buttons prior to pressing to leave no impressions. Get professional tailoring and alterations done onsite from our seamstress with more than 30 years of experience. Get your household items cleaned and hand pressed at our locations including duvets, comforters,table linens, sheets, and tapestries. You can also get drapery services including the taking down and rehanging of drapes. Please call us if you have fine textiles which need cleaning. We want to make sure all your textiles look their best. You should always have “matching” items of a bedroom set cleaned together, such as bedspreads and pillow shams or sheets and pillowcases. Alterations and Repairs are a big part in extending and maintaining your wardrobe! 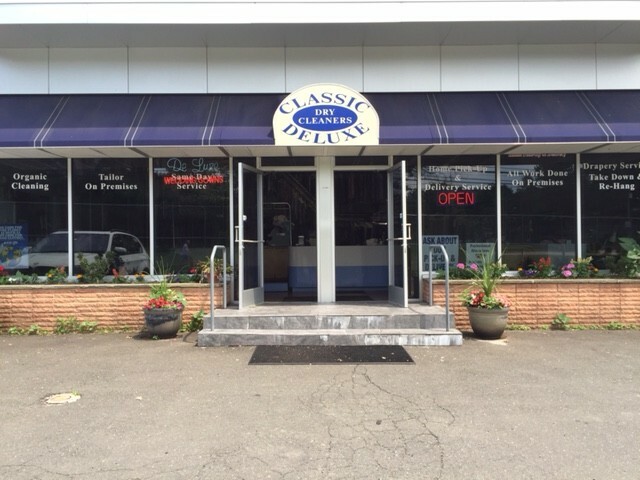 Classic Deluxe Dry Cleaners has a full time “old school” steamstress at our Hope Street, Stamford, CT location. Tina Romano has been a seamstress her whole life and is a fixture at Deluxe. Tina can take care of all your alterations from beaded evening gowns to putting an original hem on designer jeans . In addition, bring in your drapes & curtains to be shortened, relined, etc. Come in to see our tailor! No appointments needed. She is here Monday – Saturday, 10:00am – 4:00pm.